Now, more than a decade later, those three friends are back at it, remaking the film with a much bigger budget, professional actors – including Lost fan favorite Andrew (Mikhail) Divoff and horror FX maestro Tom Savini – and the backing of industry professionals Precinct 13. You can expect to see The Dead Matter at a theater near you – and on the shelves of your local video store – in 2009. 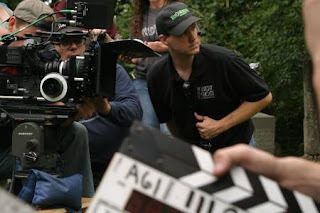 Ed Douglas (ED): Midnight Syndicate Films is the filmmaking division of Entity Productions, Inc., an entertainment company based in Chardon, Ohio. It was formed in 1994 by me and two of my fellow John Carroll University graduates, Mark Rakocy and Jeff Kasunic. Our first project was The Dead Matter in 1996. It was a full-length feature shot in Northeast Ohio using an entirely local cast and minimal crew. We didn’t have a budget back then. We shot on Super-VHS and completed the film for $2,000. We knew that the format we were shooting on had limitations, so from the very beginning our goal was simply to do our best with what we had, get the film completed, and then use that version to generate interest and do a remake of the film with an actual budget. My other love is music, and in 1997 I formed the band Midnight Syndicate. Midnight Syndicate records “soundtracks to imaginary films” - CDs that consist of music and some sound effects designed to take the listener to a world or movie of their own creation. Since 1998, Midnight Syndicate has released nine CDs. I love the horror genre. There’s something about the genre that’s sparked my imagination for as long as I can remember. So everything I’ve done creatively has tended to drift toward the darker side. So, chronologically, we started as a film production company, then became a music label and distributor for Midnight Syndicate’s music. Now it’s doing both music and film, with the film element falling under the Midnight Syndicate Films umbrella. My goal from the beginning, though, has been to do a remake of The Dead Matter. In 2006, the puzzle pieces finally came together. MMM: Tell us a bit about the 1996 version of The Dead Matter. ED: The original The Dead Matter was co-written by me and Tony Demci. We’re the same writing team on the remake, as well. We didn’t have any money at all, so it was just some hungry filmmakers doing what they could with what they had. I directed the film, scored, and edited it. Co-producer Mark Rakocy shot the film, handled all the practical FX, and the graphic design, among other things. Jeff Kasunic handled the digital FX and acted in the film. We didn’t have a crew beyond that. MMM: What’s the remake about? ED: It’s the story of a grief-stricken girl who has just lost her brother in a car wreck and is trying to contact his spirit. With her friends, she comes across an occult relic previously owned by vampires. The living dead play heavily into the movie as well. MMM: Why do a remake? ED: People ask me that all the time. “Why that particular film?” My answer is simply this: I believe in the script and the story. It’s a real story-driven horror film, indicative of the type of horror films I like to make. Strong characters, interesting plot twists, and some different takes on traditional horror themes. It was there in the original version and it’s there now, in a better way with the new version. MMM: Tell us a bit about breathing life into a new version of the movie — and having a bigger budget with which to do it. ED: Well for me, the script is the most important part of any movie. One of the things I’ve been most disappointed with in modern, mainstream horror films is the apparent lack of focus on story and script. Before I committed to a remake of The Dead Matter, I wanted to make sure that the script was as strong as it possibly could be. Demci and I spent almost two years re-working the script. We had eight years of life experience, eight years of watching more horror films, eight years of reevaluating our film. We were able to take all of that and put it into this new script. The result is a superior version of the story that we really feel will resonate with fans of horror films and suspense thrillers alike. Having an actual budget allowed me to execute the script the way I would have liked to the first time around. It’s not an effects-heavy film; it’s more about characters and story. Additionally, getting more people involved in the creation process (like director of photography Alex Esber; assistant director Phil Garrett; co-producer Gary Jones, Bob Kurtzman, designer Ben Miller, and film production company Precinct 13) made for a better end-product than was possible the first time around. MMM: Tell me a bit about the cast. You have some name actors, including Tom Savini and Andrew Divoff. How did they become involved? How much of the cast from the older version return? ED: I’m really happy with the cast. We were able to achieve a good mix of new and old talent and they all came through for us - especially important since it’s more of a character-driven film. Andrew Divoff had worked with Robert Kurtzman on projects like Wishmaster and The Rage, so Bob made the introduction and got the script to him. Divoff really liked the script (as did Jason Carter); that’s how we got them on board. Tom Savini is a longtime fan of Midnight Syndicate’s music and the script, so that’s how he came to the project. Sean Serino, CB Spencer, Tom Nagel, Donna William, and Brian Van Camp, are newer faces that rounded out the cast. A lot of the original cast made cameos in the film. The most notable reappearance was Christopher Robichaud, who reprised his role of Frank, one of the lead characters. MMM: You’re from Ohio and have had the great opportunity of shooting your film in Ohio – tell me how that came about. ED: My goal from the very beginning was to make quality horror films in Northeast Ohio. It may have taken 10 years, but it’s finally become a reality. I believe in this region. I believe we have the talent, locations, and artists to make good things happen. It was a great feeling wrapping production on The Dead Matter and knowing that we had done it in Ohio, with a regional crew, on-time, without compromising the script. The cast and crew came through, and it just gets me even more psyched for the next one, which we’ll shoot here again. MMM: Tell me a bit about where you shot the film. ED: Most locations were in the Crestline and Mansfield area. Precinct 13 is based in Crestline and the community there was very supportive. We did end up shooting in Mansfield, not only at the Reformatory, but also at the Bissman Building in downtown Mansfield. (Editor’s Note: The Mansfield Reformatory and the Bissman Building were both locations for ‘The Shawshank Redemption’.) There was a turn-of-the-century cemetery we shot at in Bellville that really added a ton of character to the film. We were really able to take full advantage of what the area had to offer location-wise. MMM: You’re in post now. How’s that going? ED: I’m very happy with what I’m seeing. It sounds kind of dross to say “filming went great, we got everything” but in this case, I really mean it. We had an extremely aggressive filming schedule and our share of unforeseen problems (like the town of Mansfield being flooded with the worst rains in 20 years). But we did it and we were able to shoot everything in the script. We shot on 16mm so the film really has a bit of that late-70s/80s look going for it. The look of 16mm contributes to the atmosphere and feel of the picture and I’m very happy with it. The score is extremely important to me, so I’ll be taking my time with that -- three months at least. And we’ll be handling most of post-production in Chardon. We haven’t decided where we will be doing our final post sound, but we will use our developer, Fotokem in Los Angeles, for the final picture. MMM: When might we expect to see The Dead Matter in theaters? Where (and when?) will the premiere be? ED: Right now, 2009. I’d like to have at least one of the premieres in Cleveland. It’s entirely possible that the soundtrack will be released before the movie, but I anticipate a 2009 release for the movie. MMM: Tell me about working with Precinct 13. ED: It was great. Bob was a fan of Midnight Syndicate and approached me to do the score to his film, The Rage. When I came down to the set of The Rage during production and saw how they ran their operations, I knew they were the perfect match for The Dead Matter. I pitched Bob the idea as soon as production on The Rage wrapped and he got behind the project. Precinct 13 has a great mix of talented artists who have spent time working on some of the biggest Hollywood pictures. They also have experience working with independent filmmakers. This puts them in the unique position to really cater to an independent producer. MMM: It’s nice to have such experienced talent locally accessible, isn’t it? ED: Having Bob move back to the Midwest is one of the best things to happen to the region filmmaking-wise - and they’re just beginning. Having the opportunity to work closely with co-producer Gary Jones was one of the most rewarding aspects of the experience. MMM: What was your budget on this project? ED: It is the largest locally-financed independent film ever produced in Northeastern Ohio. I mention that only because a lot of people told us that it could never be done. Other independent filmmakers need to know that although it’s not easy, it can be done. We’re still small potatoes by Hollywood’s standards, but anytime the budget gets above seven figures it’s an accomplishment and, I hope, a good thing for independent filmmaking in this region.